Stop trivializing visual management — the returns are too large to ignore. The winter issue of Prairie Manufacturer Magazine confirmed 5S for what it is: Workplace organization, where everything is in a known place when not in use. While it is a straightforward concept, the success of its application depends upon management’s leadership and daily discipline. 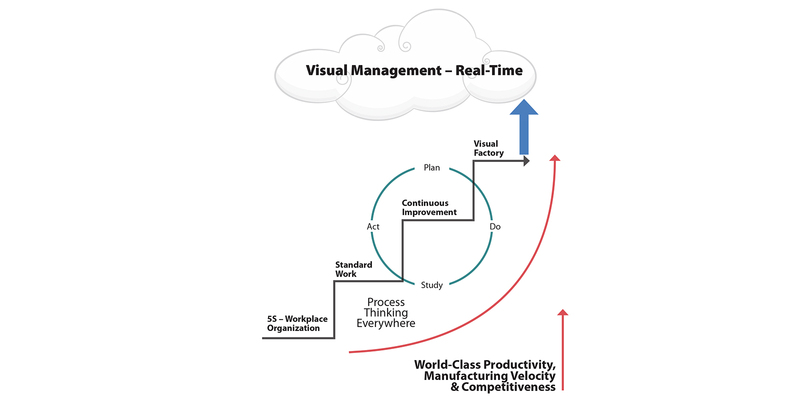 The illustration on this page shows a simplified movement of elements that gradually propel lean practitioners from basic 5S toward true world-class performance — a journey reliant on a visual workplace to drive improvements in safety, productivity, waste reduction, and competitiveness. Don’t take it from me. Remember, Toyota Way author Jeffrey Liker cites that very necessity as his seventh principle of management: “Use visual controls,” he writes, “so no problems are hidden.” Every step of the manufacturing process depends on visual management to ensure optimized flow. Recall situations in your own life where spoken words have been taken out of context or misinterpreted, resulting in mistakes, arguments, or offence to another individual. Using visuals or models to share ideas is a more universal form of communication. Unfortunately, in industry, this is still not fully understood. Making one’s workplace more ‘visual’ demands serious thought. It is far too easy to dismiss visual improvements as ‘elementary,’ but that is often exactly the intended effect. People are routinely distracted by ‘shiny objects,’ while ignoring simple visual cues that would yield greater value. Leaders who get it bear zero tolerance for anyone who demeans 5S or visual management as ‘just housekeeping.’ It is far more than that. Visual management has the power to deliver more ‘money in the bank’ than many other factory improvements. That impact is multiplied when paired with top-down leadership and support, employee involvement, routine ‘quick eye’ assessments, and visual thinking. It will require honest self-criticism, careful planning, and coaching. On the Prairies, however, there are already great opportunities for manufacturers to see the practice in action. One of the best examples is the New Flyer bus plant in Winnipeg, where visual innovation and visual management rule the day. There, they have ‘extracted’ the visual strategies used in dentists’ offices to guide their own decisions around layout design and communication, and to train employees on the real-world value of 5S and visual aids. Visual controls can come in an almost infinite number of forms, from electronic display boards and start-stop lights to uniquely coloured clothing for different cells or production teams. If you’re starting from scratch, there are plenty of resources out there to help steer you along the early stages of implementation. Dr. Galsworth has written seven well-illustrated books — all of which are available at online retailers such as Amazon — and has published extensive research and ‘how to’ guides. Over her career, she has found that visual management can generate a 45-65 per cent reduction in space, equipment changeover, classroom training time, and annual inventory time, as well as a 65-90 per cent improvement in flow distance, rack storage, and non-conformances in assembly. The training efficiencies are especially noteworthy, and are seldom considered. By harnessing the ‘visualization’ of processes, the training required to execute said processes is simpler, more clearly understood, and less error-prone. Once you have a general understanding of the theory, start percolating ideas and forging a common understanding by walking through your horizontal value stream with your leadership team and most innovative thinkers. As the benefits become visible, so, too, will the fear of what your competitors might achieve by putting visual management to work before you. Interest in this topic is accelerating at conferences and in trade publications as folks consider the risks and opportunities that lie ahead. This may just be the right time for a new way of seeing. Dave Hogg is one of Canada’s premier thought leaders on lean manufacturing, and previously served as long-time editor of the distinguished Accelerate the Journey newsletter.